For outdoors options, Chicago is spoiled by its remarkable stretch of lakefront trail, beaches, and parkland scattered across the city, which we naturally tend to flock to as often as possible. However, for a real change of scenery, plenty of hiking opportunities abound just outside the city limits. Most of them are under-the-radar spots (no aimless tourists to weave through) and ideal settings to hit the trails on your next outdoor adventure. The Forest Preserve District of DuPage County offers the perfect daytime hike through 2,492 acres of prairies, savannas, and shaded, oak-maple woodlands surrounding the Argonne National Laboratory. 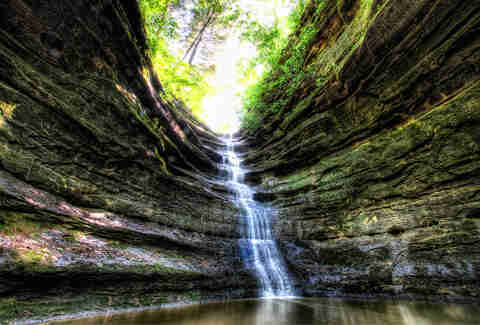 The multi-use, crushed limestone Waterfall Glen loop pauses atop a lofty vista overlooking the Des Plaines River and near a gentle waterfall (off the main path via the .2-mile Rocky Glen trail). Turns out the preserve is actually named after Seymour "Bug" Waterfall, an early board president, not its popular waterfall (? ), but it's still a picnic-worthy spot. On foot, visitors can even explore the narrow, unmarked pathways crisscrossing through the preserve. But remember where you came from since they may or may not reconnect with mapped trails. Traverse the gravel hills (or kames), cattail marshes, and leatherleaf bogs left behind by ice age glaciers that once covered this 400-acre nature preserve (encompassed by 3,000 untouched acres). 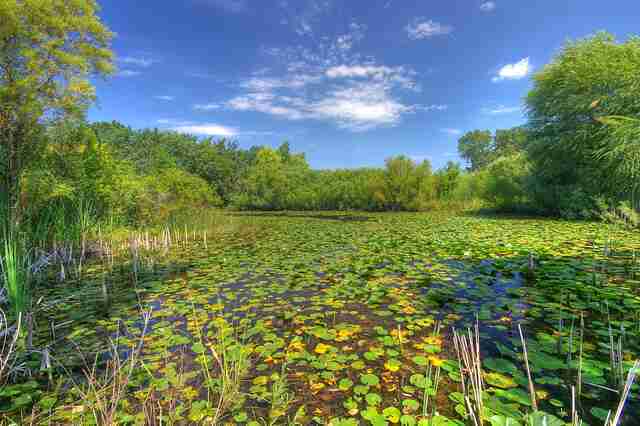 Part of the Hackmatack National Wildlife Refuge, the park is one of the top five areas to view migratory wetland birds in the region. The two-mile Interpretive Nature Trail follows the Deerpath Trail loop; paired guide books cover the region's plants, wildlife, geology, and history as you go. Hike or horseback along over eight miles of designated park trails, fish the shoreline of Nippersink Creek, or bike a five-mile portion of the 26-mile Prairie Trail skirting the park's eastern boundary. Witness sunset-colored sandstone bluffs, red-bellied woodpeckers, and swallows diving for insects while kayaking along Rock River or sharpen your photography skills along six miles of marked hiking trails, which are prime cross-country skiing and tobogganing paths in the winter. 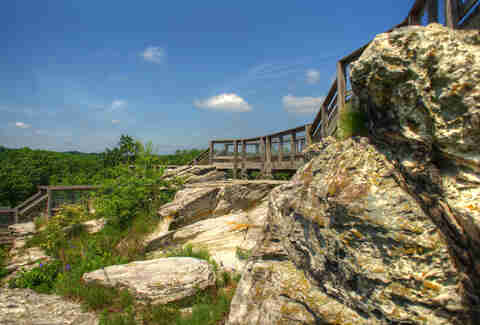 Short, but quiet and scenic trails lead to fantastic river views at the bluff-top overlook. The region's rolling topography and woodlands also present stellar overnight camping. While the North Branch Trail between Caldwell and Devon Avenues and the Chicago Botanic Garden is deservedly revered, the Des Plaines River Trail winding along its namesake river is an exceptional Chicagoland feat. 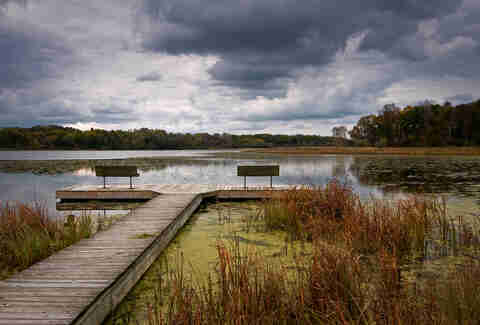 The 31-mile stretch passes through both the Forest Preserves of Cook County and the Lake County Forest Preserves. Spanning Lake County from Lake Cook Rd almost to the Wisconsin border, you'll pass through forest preserves, wetlands, and the Independence Grove Forest Preserve. Bridges and underpasses help avoid busy roadways for uninterrupted trail time. 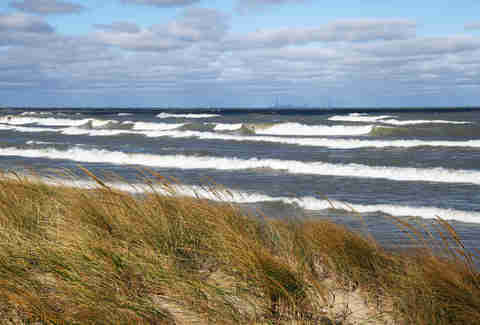 Stroll the sandy Indiana Dunes National Lakeshore via the West Beach Loop to experience what Carl Sandburg deemed the "Grand Canyon of the Midwest." Climb mountainous dunes, skirt an ancient marsh, and end within a stone-skipping distance of Lake Michigan's coastline, which showcases the Chicago skyline from across the way. The park has other easy-going and challenging trails like the Ridge Hollow Loop, Cowles Bog Loop, and Ly-co-ki-we Trail to explore the shoreline dunescape, shaded hollows, and boggy wetlands. This state park's 18 beautiful canyons (14 of which have waterfalls) and more than 13 miles of trails (which are open year-round) definitely require a visit. You'll want to budget time to explore. Tap into the vertical, moss-covered stone walls formed by glacial meltwater, which slice through tree-covered sandstone bluffs. The Illinois Canyon Trail (9.4 miles out and back) is one of the only untouched trails in the park (no man-made walkways or stairs here). After a heavy rain, you'll not only discover a waterfall at the trail's end, but also up to five other smaller waterfalls along the way. Even on a sunny afternoon, exploring this gigantic grassland (pronounced "mi-DAY-win") can be slightly eerie because it's filled with abandoned military bunkers from the former Joliet Arsenal. It became the first US National Tallgrass Prairie in 1996, and now the US Forest Service, National Forest Foundation, and other partners are working to restore its nearly 20,000-acre native tallgrass prairie ecosystem, even bringing bison back. Hike a 13-mile loop formed by the Group 63, Bunker Field, and Twin Oaks trails to scope out some of the retired bunkers. 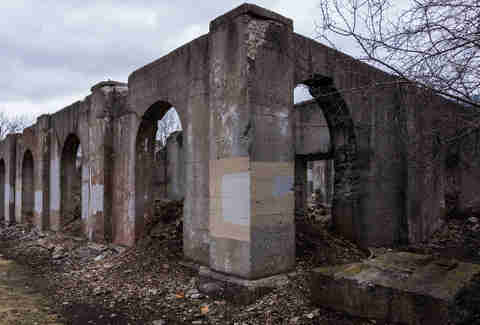 A short paved trail weaving through the ruins of the Joliet Iron and Steel Works, which was once the second-largest steel mill in the US, provides a fascinating look at the iron and steel production process. After taking over the 52-acre site in the 1990s, the Forest Preserve District of Will County installed signage along the route to explain the purpose of various buildings. 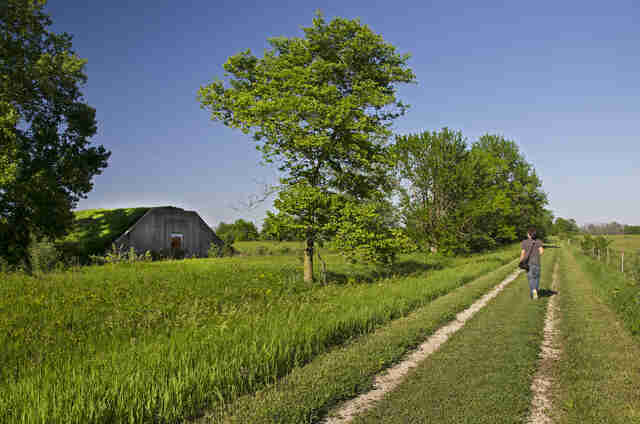 Visitors can also hop on the scenic Illinois and Michigan Canal Trail, which stretches about 11 miles from the iron works north to the Romeoville Prairie Nature Preserve. 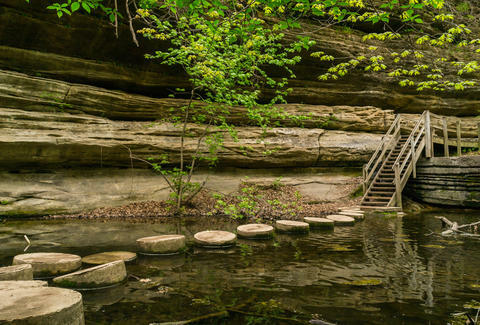 Well-marked trails amid the canyons, streams, prairie and forest area of this nearly 2,000-acre state park lead to big payoffs like scenic views of the Vermillion River and cascading waterfalls with impressive drops. The highlight is a narrow, mile-long sandstone canyon carved by moving water, which can be reached via a moderately strenuous 5.8-mile hike. You'll briefly follow the edge of the Upper Dell before dipping toward the shady canyon floor, where hikers can take in the falls and snap a Giant's Bathtub pic. Outdoor enthusiasts find this park's abundant wildlife and naturally channeled river unsurpassed. 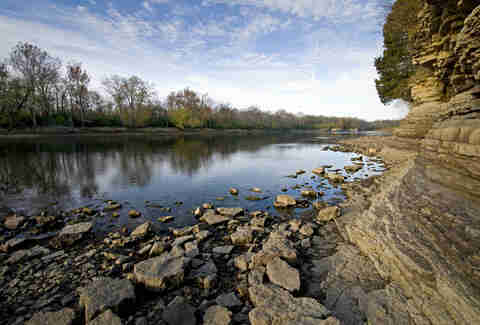 The 4,000-acre park and trail system envelopes both sides of an 11-mile stretch of the Kankakee River, a popular spot for landing smallmouth bass, channel catfish, walleye, and pike. 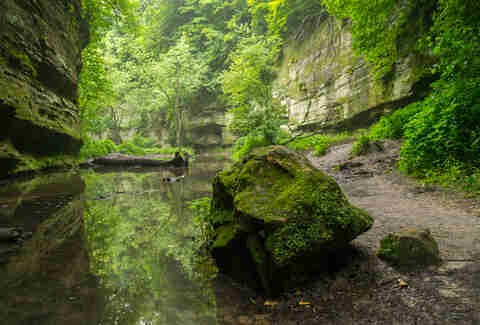 The partly paved Rock Creek Trail follows the eponymous creek through wooded bluffs and a dramatic 200ft-deep limestone canyon on the way to a frothy, 8ft waterfall. Nicole Bruce is a contributing writer for Thrillist. She wishes she'd known about these hikes before "training" for Mt. Kilimanjaro in Chicago seemed regulated to the steepest treadmill incline and breaking in boots once on the lakeshore path. Follow her on the Twitter trail at @nicoleabruce.